On his first day on the job, Richard Cordray expanded the scope of the CFPB’s regulations to include many highly predatory financial outfits. 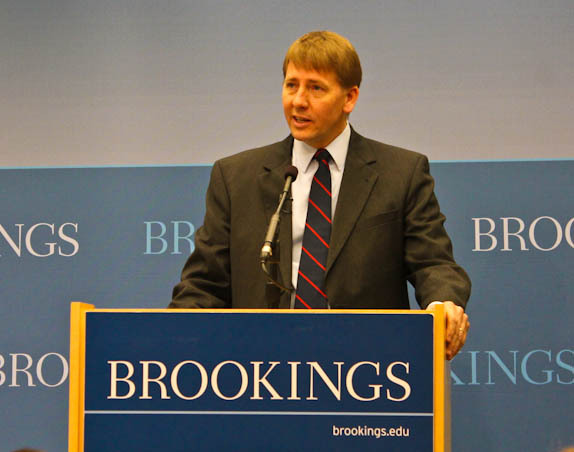 Richard Cordray addresses a crowd at the Brookings Institution on January 5, 2012. Photo credit: George Zornick/The Nation. Cordray also announced the bureau’s program to supervise non-bank financial institutions like payday lenders, check-cashing operations, debt collectors, and other outfits that don’t have FDIC backing—something the bureau wasn’t able to do without a director. Cordray devoted some of his remarks to telling the stories of Americans who reached out to the bureau for help: there was a woman in Louisiana who had a payday lender attempt to force her into bankruptcy, and another in North Carolina who missed one mortgage payment when her husband died and then saw years of penalty increases. The bureau’s website prominently features opportunities for Americans to report difficulties with financial institutions, and Cordray said he views this outreach and response as the central template for the CFPB’s mission. He also recorded a plea for more stories yesterday and released it on YouTube. Asked specifically about the danger of regulatory capture when soliciting input from the financial industry—something Cordray pledged to do in his speech—he said that the antidote is this communication with consumers. The financial industry has of course spent the past seventeen months trying to capture the bureau, through deep-pocketed lobbying efforts and political gamesmanship to deny the CFPB a director. Though that effort was unsuccessful, the industry isn’t likely to give up. The American Bankers Association blasted Cordray’s appointment as evidence of a “lack of accountability,” and Cordray has already been summoned to testify before one House subcommittee. Extensive legal challenges are also likely.